We’re approaching the time of year when our holiday basket weaving can fulfill a variety of uses. 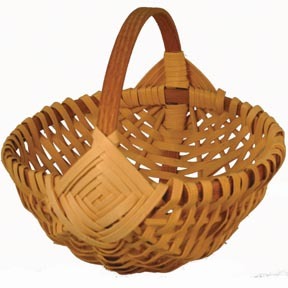 For our family, Christmas decorating with baskets began 30+ years ago with our Christmas Ornament Basket, a super easy basket that was our second basket weaving kit. This Christmas Ornament basket is also a fun and easy project for the November meeting of your craft group. We have a Christmas Ornament Teacher Special that makes it especially inexpensive to weave. Less than a dollar per person for a pattern and enough reed to weave TWO Christmas Ornaments baskets! After being introduced to flat reed basket weaving with our Original Beginner’s Basket Weaving Kit, students asked for a round reed basket. Since Christmas was coming, I laid out a simple base and finished the top edge with a border that looks like a complicated braid. In actuality, it’s super easy because it’s woven in more than one round. It’s not braided. I wove a tree full and filled them with handmade calico birds. 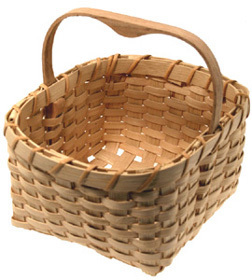 Gift-giving with baskets is a fun tradition. When our sons were young, we baked a zillion Christmas cookies and bagged up assortments in the freezer. 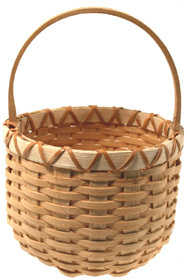 Then we wove a dozen or more Cape Cod Blueberry baskets or Melon baskets and always had a handy gift basket for teachers and support staff. This was also really handy for last minute hostess gifts—for occasions like last minutes invitations.